I've only been to Lock & Co. Hatters twice, but both times I've found myself staring at the Fezzes and the smoking caps. Are there men who still wear smoking caps? And, unless you're a Shriner or you live in the Middle East or Turkey, at what kind of occasions would you wear a Fez? If you know of other Fez wearing groups or occasions that call for the hat, please tell me. 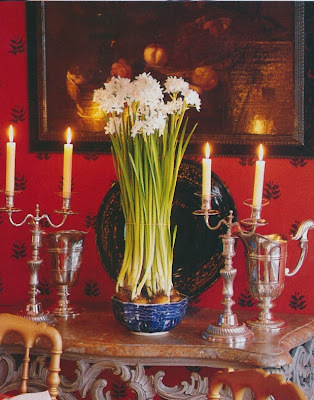 What I have noticed, though, is that Fezzes often make decorative appearances in homes. Hamish Bowles' entrance hall comes to mind, as does the master bedroom of designer Alex Papachristidis. I recently spied one in a London home that was featured in the November issue of UK House & Garden. 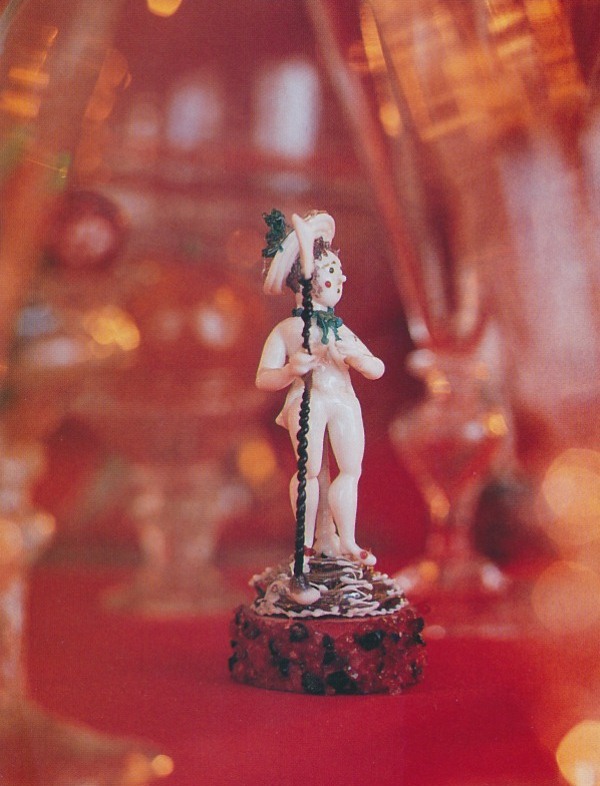 Some people choose to display their fezzes solo, while others place the hats on busts and sculptures. 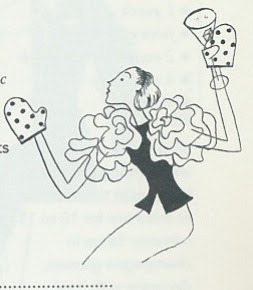 Unfortunately, I haven't been able to find a vignette featuring a smoking cap, but I'm sure it's out there. 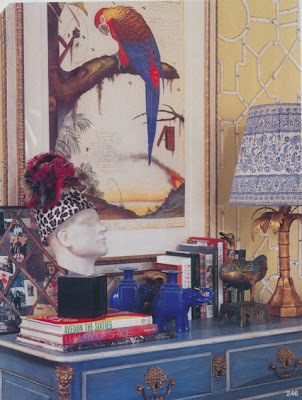 The Fezzes in Hamish Bowles' apartment appear to be vintage Shriner hats. 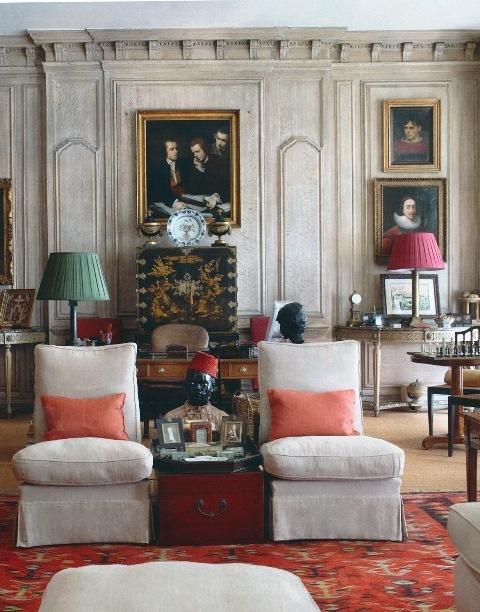 In this London home, a Blackamoor bust wears a Fez. Alex Papachristidis' Fez may not technically be a Fez, but it suits the purpose of this post. 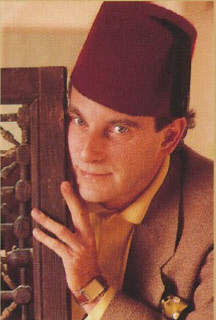 The French photographer Jean-Pierre Godeaut wearing his Fez. 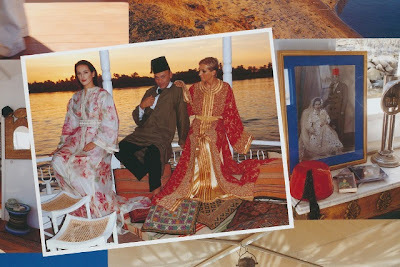 Christian Louboutin wearing one while in Morocco. Louboutin also owns the beaded red Fez to the right that was designed by milliner Stephen Jones. 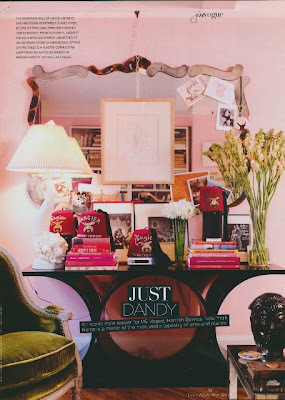 Bowles photo from Vogue Living, Mar/April 2010, Stewart Shining photographer; London photo from House & Garden, November 2011, Mel Yates photographer; Papchristidis photo from Elle Decor, Roger Davies photographer; Godeaut photo from Paris Interiors . 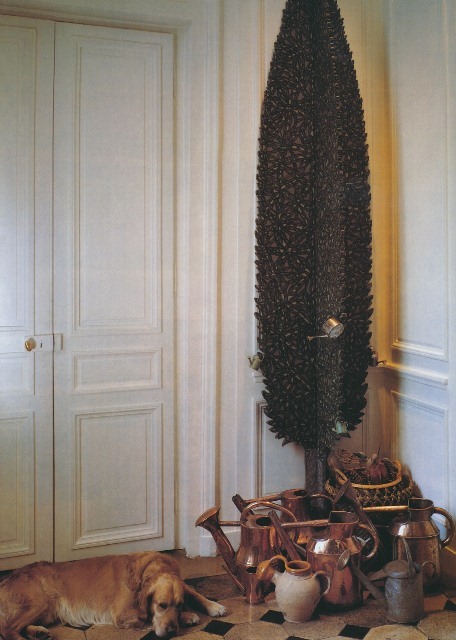 Louboutin photo from Vogue Living: Houses, Gardens, People , Francois Halard photographer. 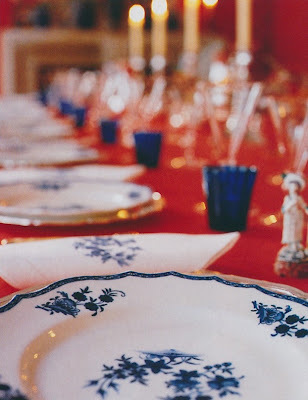 Because so many of us are already decorating our homes for the holidays, I figured that there was no time like the present to start writing about Christmas table settings. While rifling through my holiday files over the weekend, I found this Veranda article about Christmas entertaining in the Paris dining room of Barbara and Didier Wirth. 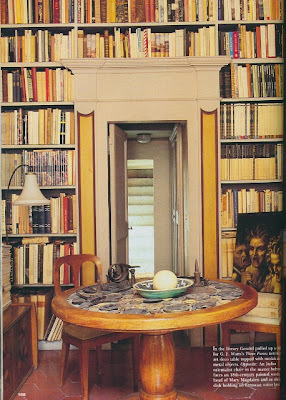 Coincidentally, I happened to find other photos of the Wirth's Paris apartment in the book Paris Interiors . I'm not sure if this is the same apartment or not, but the photos are so attractive that I wanted to include them as well. 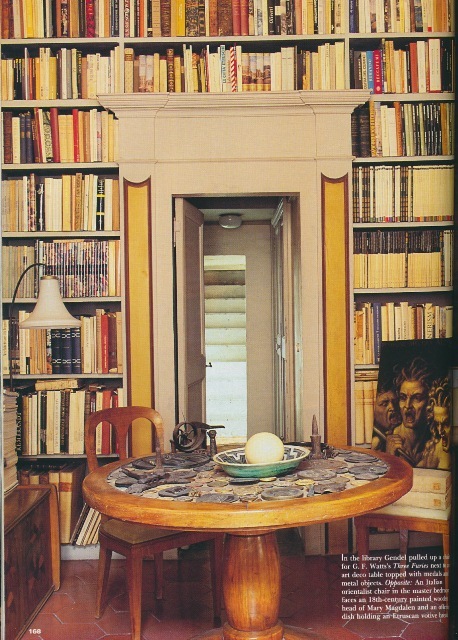 You can see the Wirths' entrance hall and study below. 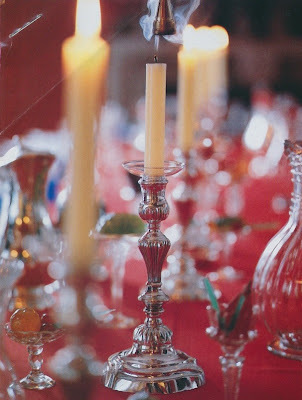 Dining room photos from Veranda, Thibault Jeanson photographer. Remaining photos from Paris Interiors , Eric Adjani photographer. Articles about how the stars live at home have always helped to sell magazines. 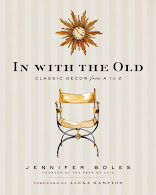 Not only has the roster of popular actors and actresses changed through the years, but so too have the decorative styles with which they choose to live. In the 1930s, more than a few actresses resided in homes that bore striking resemblances to the glamorous movie sets of the era. But, by 1940, some of that Hollywood pastiche seemed to give way to more established styles like French Provincial or even Early American. 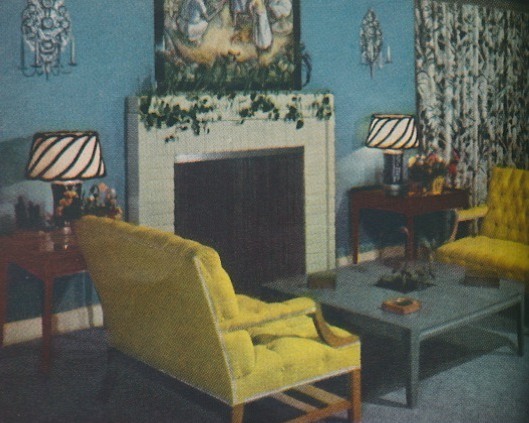 The homes featured here appeared in the November 1940 issue of House & Garden. It seems that designer William Haines had a lock on the Hollywood movie community as five out of the six homes shown were of his doing. The sixth home was designed by Tom Douglas. While some rooms bear the mark of drama that you might expect from the likes of Ann Sothern and George Cukor (who of course was a director rather than actor), others seemed to evoke a sense of East Coast propriety. 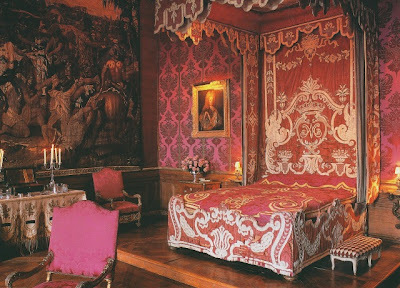 That bedroom of the Richard Wallaces looks like a room in which one of Katherine Hepburn's characters might slumber. The dressing table of Ann Sothern which, according to the magazine, was planned by Sothern herself. 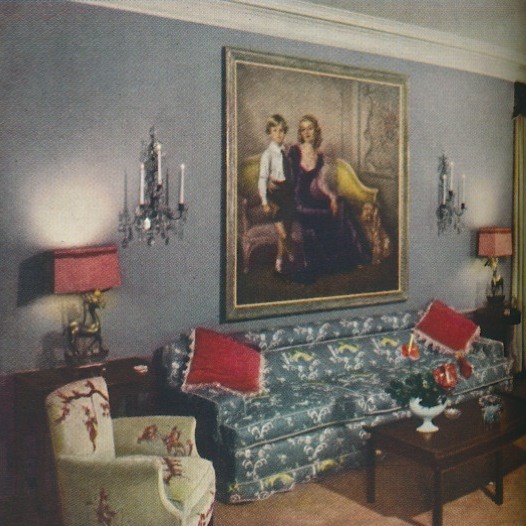 Helen Conway of William Haines decorated the room. The Richard Wallaces' bedroom designed by William Haines. 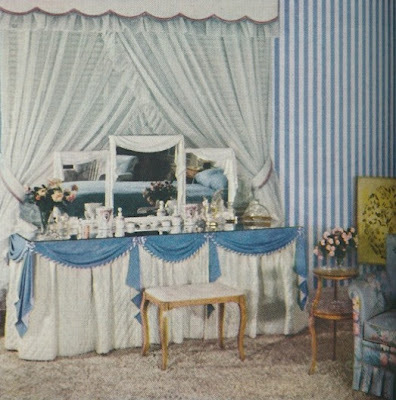 A rose chintz covered the walls, windows, and the headboard. "Constance Bennett likes a formal setting", or so said House & Garden. 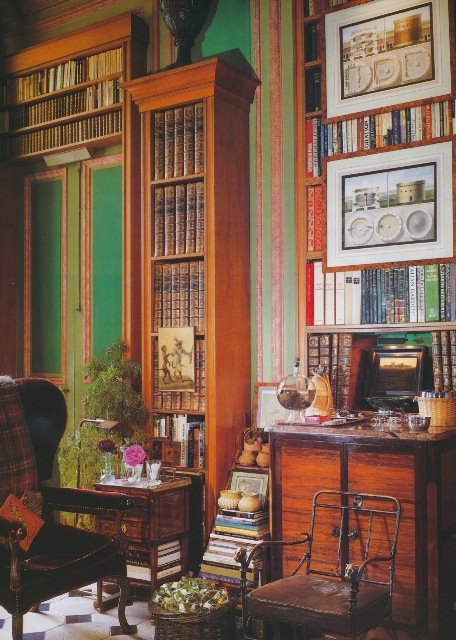 William Haines, decorator. 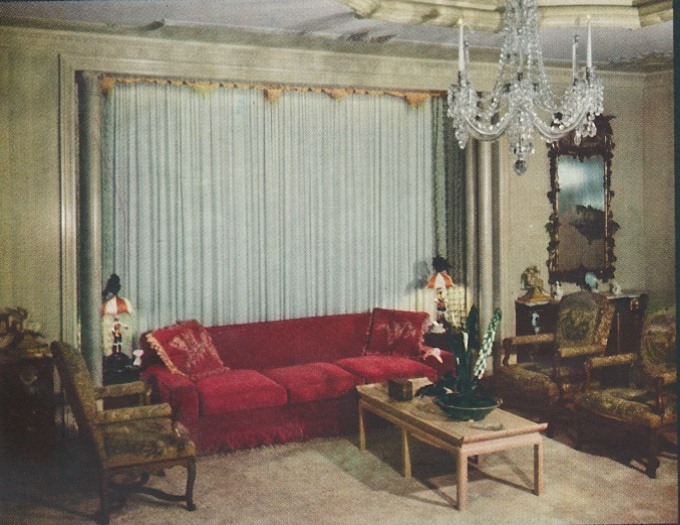 "Chinese elegance" in the William Haines' designed living room of George Cukor. One of the only houses in this article that was not designed by Haines. The home of Wayne Morris was the handiwork of decorator Tom Douglas. Tropical flowers abound in actor Sam Jaffe's entrance hall. William Haines, decorator. 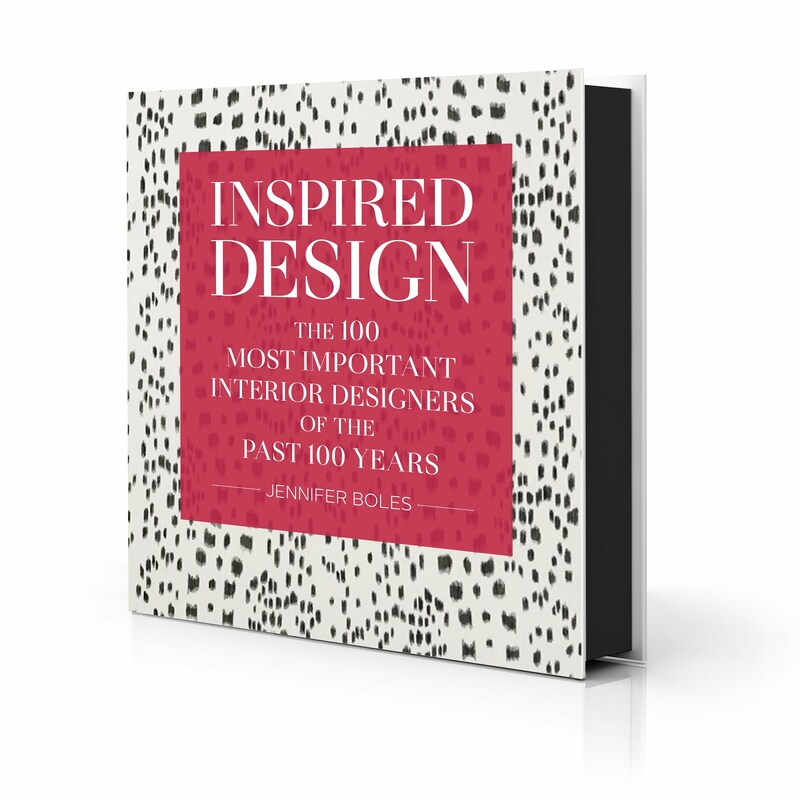 Mark it on your calendars: the Isabel O'Neil Studio Holiday Sale will take place this Thursday, December 1 in New York. 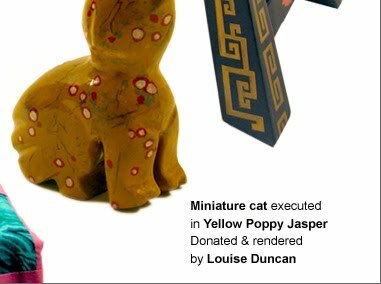 More than a few people have told me that this annual sale is an amazing opportunity to purchase exquisite and unique decorative painted objects. This is sure to be a great way to take care of your holiday shopping. For more information, click here. 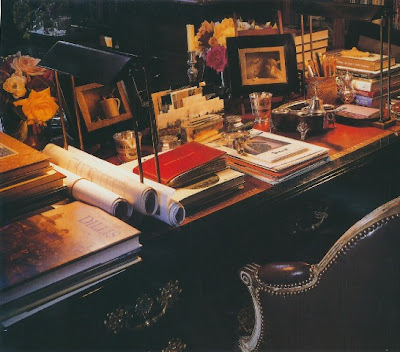 I was not familiar with Milton Gendel until I read the November issue of Vanity Fair. 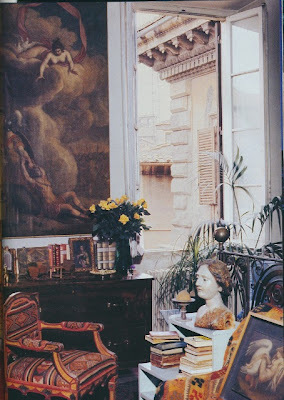 Gendel, an American who has lived in Rome for close to sixty years, decamped to Italy following World War II, working as a cultural and public relations consultant at Olivetti and later at Alitalia. 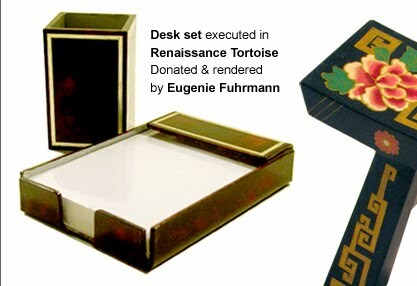 In addition, he has been a correspondent at ArtNews since 1954. 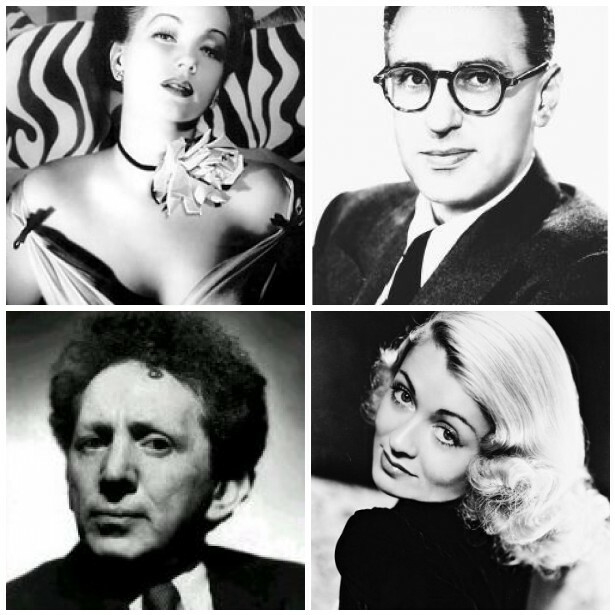 But what Gendel is really noted for- and what earned him an article in Vanity Fair- are his photographs of his friends. Having traveled in rarefied circles for decades, Gendel's friends have included the likes of Queen Elizabeth and Princess Margaret, the Cushing Sisters, Lady Diana Cooper, and Stavros Niarchos. Needless to say, these are no ordinary photographs of ordinary friends. The 92 year old certainly seems to be having a "moment" what with two concurrent retrospectives of his photographs. 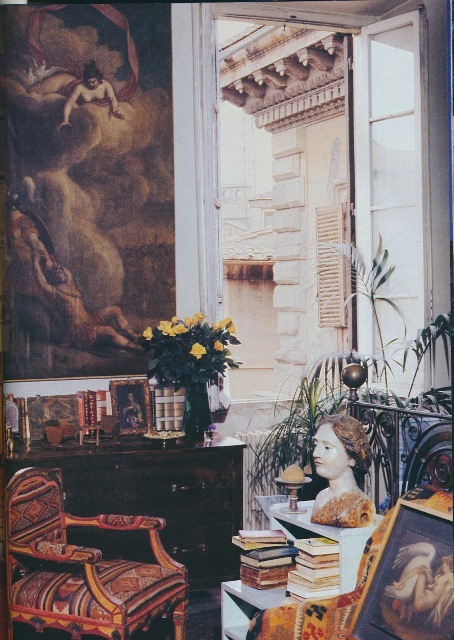 The American Academy in Rome is currently exhibiting "Milton Gendel: Portraits" through the end of this month, while a second show at Museo Carlo Bilotti runs until January 8, 2012. Gendel also recently moved to a new apartment after having lived in some fabulous apartments in various Roman palazzos. 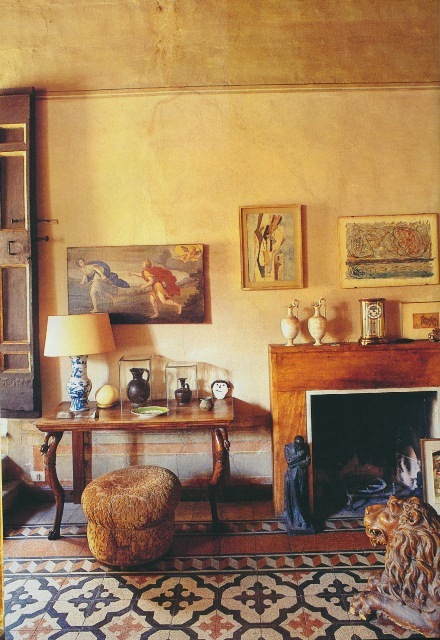 Coincidentally, I just found a 1992 House & Garden article on his former apartment in a Renaissance palazzo. 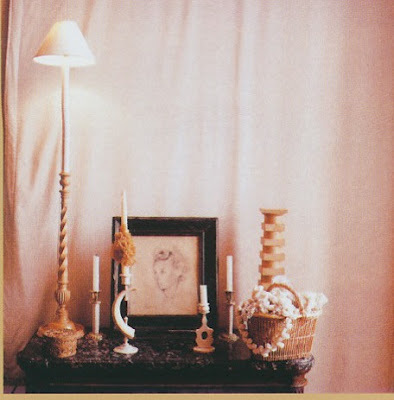 For those of you who recently read the Vanity Fair article, I thought it would be interesting to show the 1992 apartment photos here. 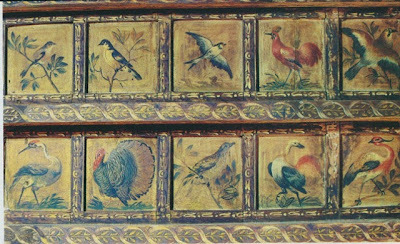 A detail shot of the sitting room's ceiling. 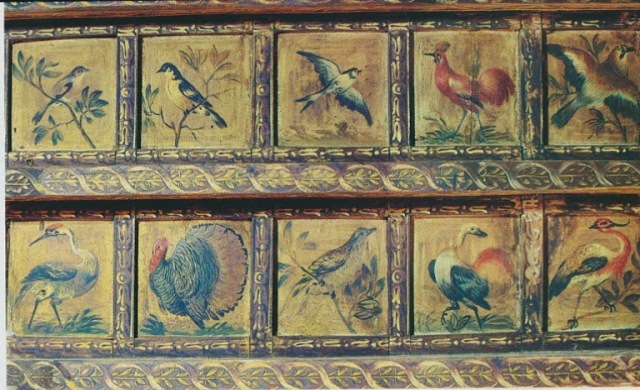 The 17th century polychrome ceiling depicts an array of birds, including a turkey from the New World. A shot of the sitting room itself is at the very top of the post. 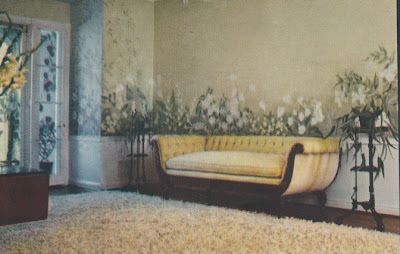 Another shot of the sitting room. 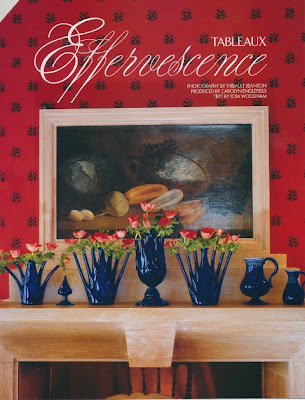 All photos from the November 1992 issue of House & Garden, Oberto Gili photographer. During the holidays, stories of family strife abound. Inevitably, there is one relative who makes you wish that you were sitting in a dentist's chair getting a root canal rather than at the dining table eating turkey and dressing with your family. I'm very fortunate because I actually get along with my family, and because I do have such a small family, the likelihood of there being fisticuffs on Thanksgiving Day is nil. Of course, a Martini is a very personal thing. Some like it with gin while others prefer vodka. Some drinkers like theirs with a few olives, while to others, only a twist will do. I think that what we can all agree upon, though, is that a Martini does indeed have magical powers that might make you forget about being stuck at the table next to an insufferable relation. But remember, Martini moderation is key. As Dorothy Parker once wrote, "I like to have a Martini, two at the very most; three, I'm under the table, four I'm under the host!" Every few years, the military look makes an appearance in fashion. 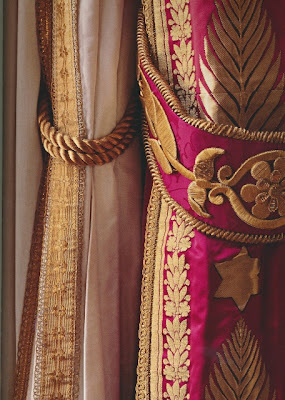 Sometimes it's the cut of a jacket or coat that is reminiscent of a soldier's uniform, while in other seasons it might be a far more literal interpretation with clothes adorned with epaulets, braiding, and other embellishments. Peacoats I can do, but if a jacket has military gewgaws all over it, then that's a trend that I usually don't partake in. But what about the military look in furnishings? Again, I'm on the fence on this one. 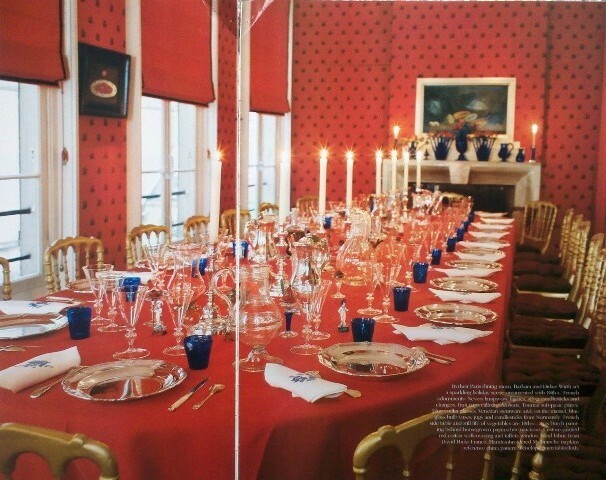 Campaign furniture and tented rooms? A wholehearted "yes" and "yes". 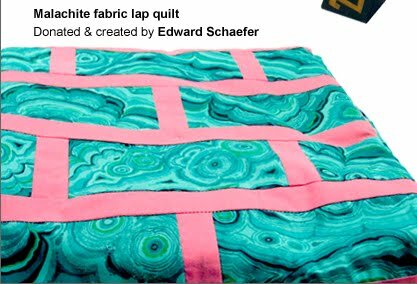 Embroidery and braiding on furniture and soft furnishings? Well, maybe. I guess it's the embellishments that trip me up. 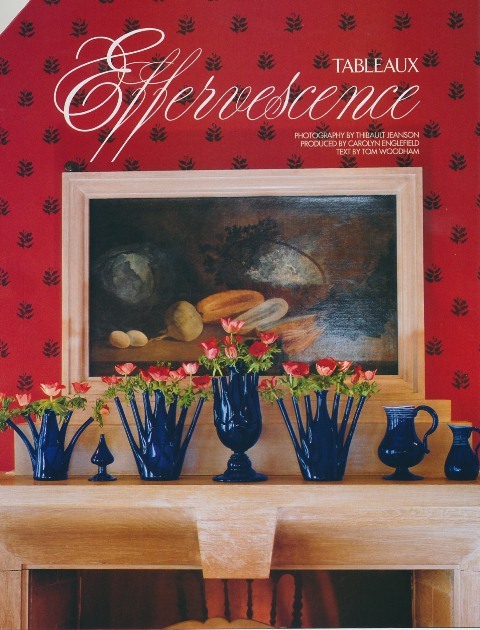 But I'm reconsidering my opinion after reading an August 2004 World of Interiors article. 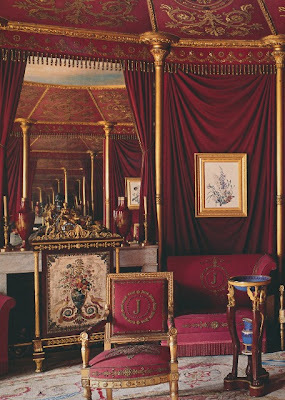 In it, furniture was upholstered with various military style details like metallic embroidery and trimmings that look like an officer's uniform. Take the sofa at top, for example. 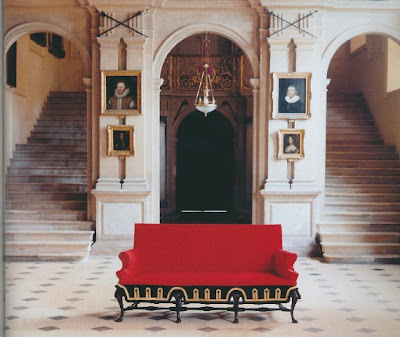 It's quite different from the average sofa, and it wouldn't look out of my place in my study. 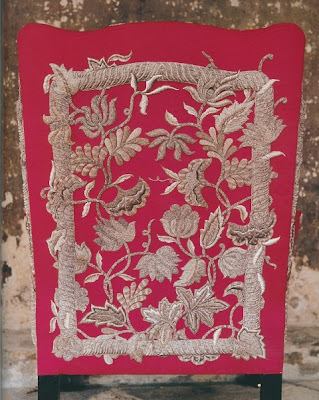 And while some of the more intricate embroidery is too grand for my own home, it might be a nice finishing touch in the right surroundings. While I might not go as far as saying "I love a chair in a uniform" (with apologies to Gang of Four and their early 1980s hit of a similar title), I think that I could be coming around to regimental details. You just won't catch me wearing epaulets anytime soon. Metallic embroidery by Layla Moussa. The back of this chair is reminiscent of an old military waistcoat. Don't you think that the design of the sofa throw pillow resembles a military medal? 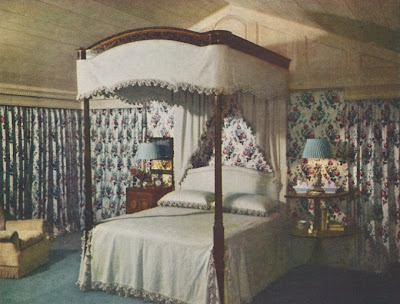 The metallic braided embroidery on both the bed canopy and the bed spread reminded me of military details. This bed is at Hatfield House in Hertfordshire. 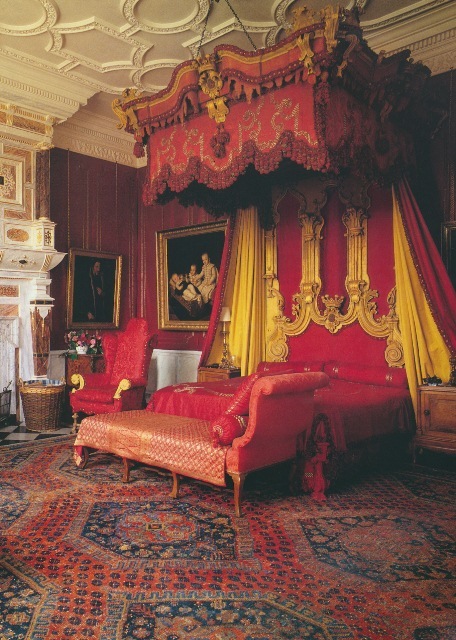 Again, this bed's embroidery is evocative of military uniform embellishment. 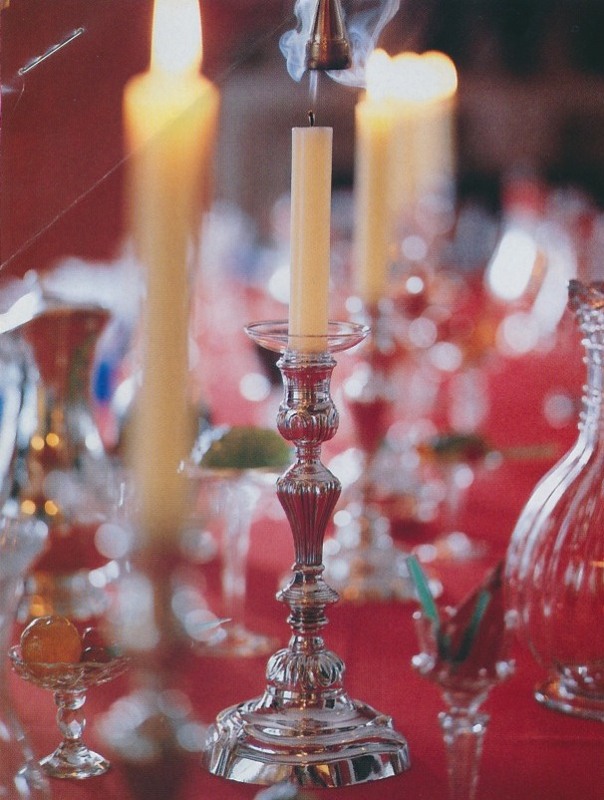 At Château de Haroué. One would expect military, Empire style details in Josephine's bedroom at Malmaison. 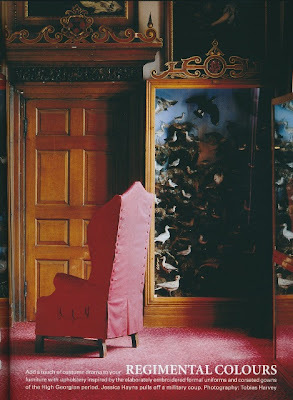 The intricate embroidery on the chairs is stunning. Curtains and bed hangings in Napoleon's bedroom at Château de Compiègne. 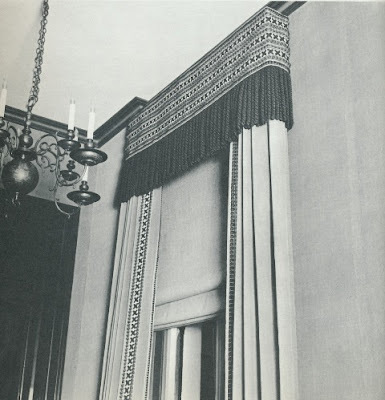 I've shown this photo before; the braided trim on these curtains by Billy McCarty looks like something you might see on a solider's shoulder. 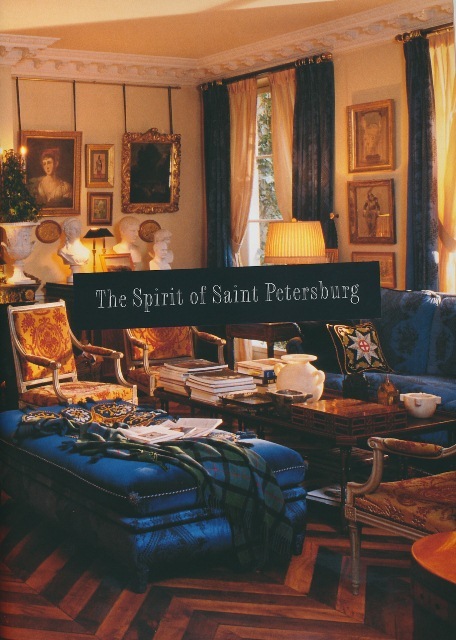 First three photos from World of Interiors, August 2004, Tobias Harvey photographer; #4 from The Finest Houses Of Paris ; #5 from Interiors by Minn Hogg; #6 from Private Splendor: Great Families at Home ; #7 and #8 from Empire Splendor: French Taste in the Age of Napoleon ; #9 from David Hicks on Decoration--With Fabrics. .